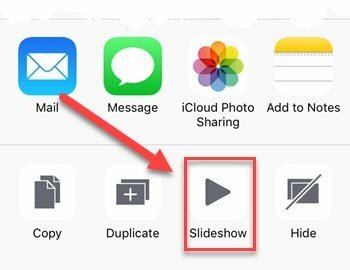 If you want to show your photos in a slide show even showing off your Ken Burns-like skills (see Wikipedia – Ken Burns Effect) your iPhone can present your photos in a slide show. With the slideshow, you can present the photos in any album as a slideshow. Here is the step-by-step walkthrough. Organize the Photos you wish to include in your slide show into a folder in the Phots app. In the Photos app and select the album that you would like to use in your slideshow. Tap the picture you wish to have as the start of your slideshow. With your image selected, tap on the Share icon at the bottom left. It will automatically begin to play with the default settings. Your can change how your slide show displays, the speed, music and type of transitions under options. Pause the slide show by tapping the slideshow and tapping Pause at the bottom center of the screen. Here, you can edit the Theme, Music, whether or not it Repeats, and the speed that the slideshow plays. Once you’ve made your changes, tap Done. It will begin to play. Playing the Slideshow on a bigger screen? There are two methods commonly used for playing your slideshow on a TV screen. Use a cable adapter like the Apple Lightening to HDMI Adapter. Connect to TV to Apple TV and play the Slideshow with AirPlay.